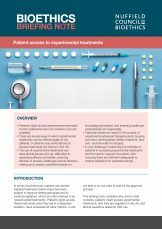 This briefing note examines the ethical issues that can arise when patients and doctors wish to use experimental treatments. Patients might access experimental treatments if other treatments have not worked or are not available. There are several ways in which experimental treatments can be offered legally to UK patients, or patients may travel abroad to access treatments not offered in the UK. The use of experimental treatments can raise ethical issues such as: difficulties in assessing efficacy and safety; ensuring fairness of access; challenges around decision making and consent; potential impacts on knowledge generation; and ensuring healthcare professionals act responsibly. Particular issues are raised in the context of experimental advanced therapies (such as gene and stem cell therapies), fertility treatment ‘add-ons’, and innovation in surgery. A core challenge is balancing the interests of patients in accessing experimental treatments and the need to support innovation, with ensuring there are sufficient safeguards to protect patients from potential harm(s).